At least it is at our house, which means the dining room is taken over by our set-up. No more fancy dinner parties for us until everything gets moved to the greenhouse in a few months! 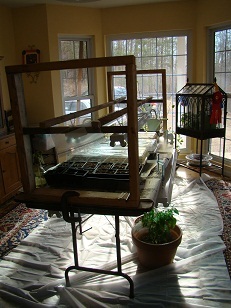 Shower curtain liners cover the oriental rug and grow lights are mounted above and below a utility table. That’s our ghost pepper plant in the pot under the table, it’s just starting to yield. We planted phase 1 of assorted hot peppers and heirloom tomatoes in the seed trays. We’re first to market around here with both. People jump on heirloom tomatoes after living with those flavorless grocery store ones for the last 8 or so months! Previous My $5 Quilt Next Craftster Best of 2010 – I’m in it!